Speech recognition technology enables computers to listen to and interpret the spoken word. A computer enabled with this technology utilizes the spoken word to write text or to execute commands. While the technology has been around for decades, it is only recently that consumers have incorporated it into their daily lives. We are all familiar with calling an airline and speaking out our reservation number to retrieve flight details. We also use Apple’s Siri, Ok Google, or Amazon’s Alexa to perform simple tasks for us, like turning on the lights or providing directions. Speech recognition technology has become a great way to streamline routine tasks. As it relates to business phone systems, speech recognition technology isn’t perfect. However, the technology is advancing at an accelerated rate. More and more companies are turning to speech recognition technology to carry out tasks that were once only performed by live agents. For example, our clients at LinkedPhone use this technology to receive orders by phone without live sales agents. For business owners, speech recognition is compellingly cost efficient. The savings are significant and are usually measured in terms of full-time employees. A company may connect customers and employees with a speech-driven corporate directory, providing an easy and efficient way to route calls. Callers simply speak the name of the person or department they would like to reach. A hotel may automate its phone-based reservation system. A doctor’s office may automate its appointment schedule by enabling callers to create, change, or cancel their appointments by phone. A company may enable its customers to check the status of an order, help desk ticket, or shipment by phone. A retail business may automate the receipt of product orders by phone. This set-up enables business owners to securely collect product, size, quantity, name, address, and credit card information. The software then processes the transaction and immediately sends the payment. Order details are emailed to the business owner for fulfillment. 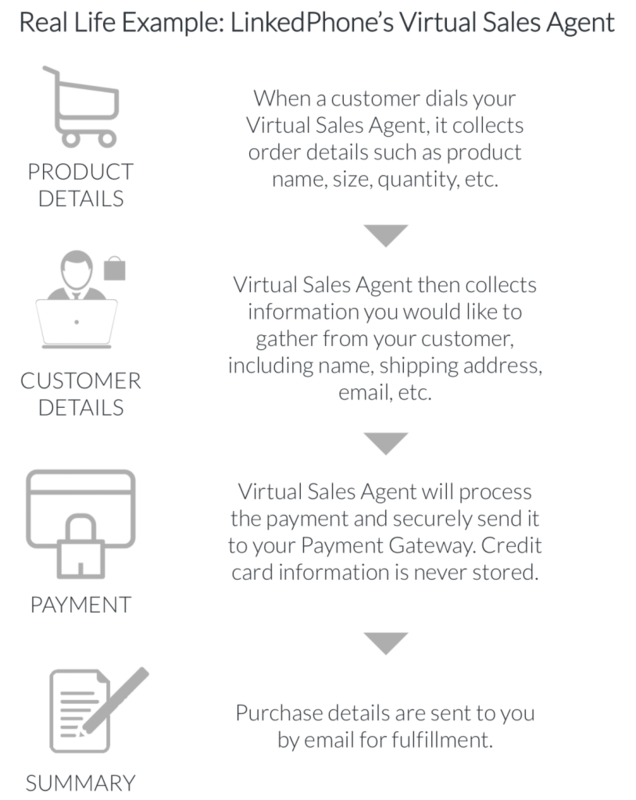 LinkedPhone offers Virtual Sales Agent enabling you to safely receive orders by phone for your product or service without a live agent. Actual use case for LinkedPhone’s Virtual Sales Agent. The growth of speech recognition technology has generated substantial competition among software providers, making it more and more affordable. At LinkedPhone, we pass those savings on to you. We typically offer complimentary design, development, and testing of our speech recognition service. That means no development or design costs for you. We also work with you to tune up and enhance your system up to 4 times a year. We’d love to hear from you. Contact us and let us know how we can build a customized automated phone solution just for you.